At $50/$100,000 the measure would narrowly pass among Eugene General election voters. This is slightly better than than the $75/$100,000. These results imply voters are price sensitive. These polling results Thursday were not as strong as Wednesday. This implies the brief flirtation with a pay raise for the county administrator hurt the proposal. As a reminder, this is not meant to simulate a countywide May Special election. This result is probably as good as it would get at this time. Based on past elections, Eugeneans are more likely to vote yes and general election voters are more likely to vote yes than special election voters. If an election were held today, would you vote yes or no on a Lane County property tax increase of $150 for a $200,000 home per year dedicated to increase the number of jail beds? 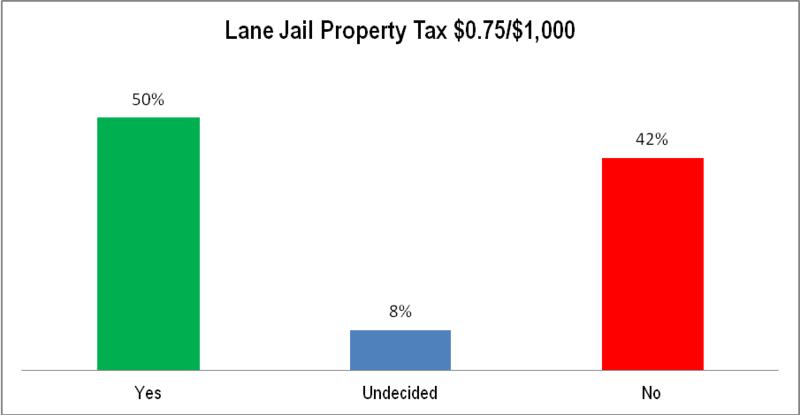 At $75/$100,000 the measure would just barely pass among Eugene General election voters. This result is probably as good as it would get. Based on past elections, Eugeneans are more likely to vote yes and general election voters are more likely to vote yes than special election voters. There are two important notes regarding these results. First, this is NOT meant to simulate a countywide May Special election. Second, the polling results Thursday were more negative than on Wednesday. The pay raise issue appeared in the Thursday morning Register Guard.